Let’s get this out in the open: I’m a homer. Not a blind homer, but a homer nonetheless when it comes to the San Diego State Aztecs. My Aztecs. I attended San Diego State University (sadly finished my degree elsewhere, though). I have been an SDSU basketball season ticket holder since head coach Steve Fisher first arrived on Montezuma Mesa in 1999, and a regular attendee during even the most putrid of days since Cox/Viejas arena first opened its doors in 1997. Hell, we paid for the damn thing, might as well use it, right? OK, so that’s done. I have a vested interest in what happens tonight in the Aztecs’ NCAA Tournament matchup with the Oklahoma Sooners and their head coach, old MWC foe Lon Kruger, formerly the boss at UNLV. You’re going to read elsewhere a lot of stats and facts about the clear advantages the Aztecs have in this one. That Steve Fisher is 14-6 all time against Kruger, dating back to their days in the Big 10—Fisher at Michigan and Kruger at Illinois. About how Fisher has absolutely OWNED Kruger while they matched wits in the MWC, with a dominating 13-5 record against Kruger’s Rebels. There is truth to the rumor, by the way, that during that time Vegas’ Thomas & Mack Center was renamed Viejas North due to the Aztecs’ dominance. There’s all kinds of commentary out there about how SDSU struggles with teams who have good big men to work the paint, and that they themselves lack any real big men with gumption. This is true. But Oklahoma lacks any true big men of their own, with Romero Osby at 6’8, 232 lbs being the biggest threat, although he has been far from dominating in the low post. Both teams have struggled to score at times—sometimes for LONG stretches of games. In their final regular season game against TCU (a loss), the Sooners were 0-16 from behind the three point line. In their Big XII Conference Tournament opening loss to Iowa St. they were 7-26 from three. Total field goal percentages in those games were 36.4% and 42.6% respectively. Meanwhile, the Aztecs play a lockdown brand of defense that can stifle an opponent. Oh, and there’s this: Sooner forward Osby is the only player on the Oklahoma roster with any NCAA Tournament experience, consisting of 12 minutes of play as a member of the Mississippi St. Bulldogs as a freshman. The Aztecs, who are making their fourth straight NCAA appearance, have a plethora of NCAA experience, starting with senior guard and four year starter Chase Tapley. Tapley and G/F Jamaal Franklin were both members of the 2010-11 Sweet 16 team. SDSU is the 7 seed, Oklahoma is the 10 seed in this tournament. The Aztecs are the clear favorite to move on to play likely opponent Georgetown Florida Gulf Coast on Sunday, right? Maybe not. Despite this being the school’s fourth straight appearance in the NCAA’s, SDSU still has two (2), and only two, NCAA Tournament wins ALL TIME in the school’s history, those coming courtesy of the Kawhi Leonard (who is now starring—and I mean starring for the NBA’s San Antonio Spurs) and DJ Gay led Sweet 16 team. The Aztecs always, for some reason, seem to choke in tourney time. Not the MWC variety, where they’ve been remarkably successful, but the NCAA kind. In 2002 they got pummeled by a very good Illinois team. No shame there. It was a 12 vs 5 matchup in a surprise Tourney appearance by the Aztecs. In 2006 they had Indiana on the ropes in Salt Lake City and blew it when Brandon Heath dribbled the ball off of his own leg trying to run the clock, and a few ticks later the Aztecs allowed unheralded Robert Vaden to hit a three point shot from Park City in the waning seconds. In 2010 they dropped a three point decision in a very winnable contest against Tennessee, who in fairness, did end up making a run to the Elite 8. 2011 saw the best team in school history completely melt down against the eventual national champs Connecticut. And last year? Well, an undersized, undermanned club (only seven available scholarship players) just plain got manhandled by the ACC’s North Carolina St. When it comes to the NCAA Tournament, typically what can go wrong for the Aztecs has gone wrong. This 2012-13 version of the Aztecs is a very talented bunch. Perhaps one of the most talented in school history, second only to that 2010-11 team that earned a 34-3 overall record. But this team that entered the season as the favorite to win the Mountain West Conference again has been anything but consistent. In fact, the most consistent thing about them is their inconsistency. 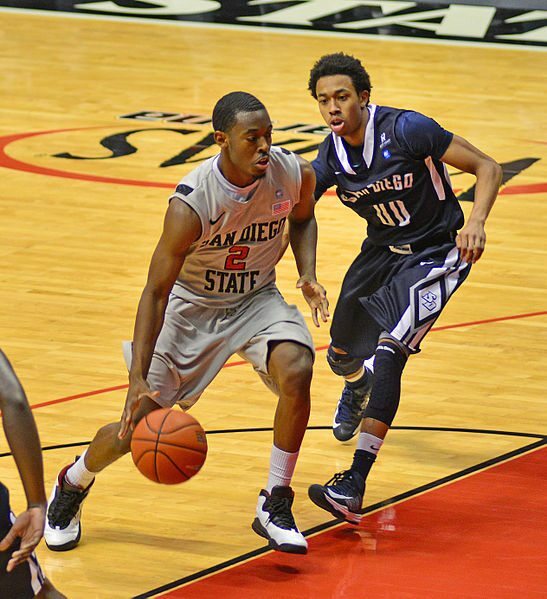 Jamaal Franklin, arguably the Aztecs’ best player, sometimes thinks he’s Kobe Bryant. He is not. Their low post players often treat the basket as if it had a lid on it, completely unable to put the ball into the hoop from two feet out; they make sinking a half-court shot look easy in comparison. And the team’s best pure shooter—Chase Tapley—often doesn’t even touch the ball for long stretches of games. Overall they are not a good perimeter shooting team, normally a death knell in this tournament. This team lacks a killer instinct. Even in games where they’ve managed to build up big leads, they tend to let their foot off of the gas pedal, only to see that lead whittled away. All year long they’ve struggled to put even the softest of opponents away. And then there’s this: Lon Kruger is due for a victory over his old friend, Steve Fisher. And they are old friends. Their wives are even friends. The Mountain West Conference has already embarrassed itself in this tournament, with three of the four teams who have already played bowing out in their first game, including conference regular season and tournament champion New Mexico, who as a three seed lost to Harvard—HARVARD!!! !—last night. Colorado State to this point is the conference’s only saving grace, with a dominating win over Missouri. So the pressure’s on the Aztecs. And this team has not handled pressure well. They’ve traveled across country to Philadelphia, and will surely have limited fan support with such a long trip on short notice. All of this is going to make for a very long and nervous day. I wish I could feel more optimistic about this one tonight, but I’ve seen this team wilt too many times this year. But…..they’ve stated that their goal as a team is to make a run in the NCAA’s. That’s been their focus all year long. Nothing else really mattered. Chase Tapley has said all the right things. “This is a business trip,” he says, and if the team follows his lead, they will be focused and ready. The regular season is over. The MWC Tournament is over. The Aztecs’ record is 0-0. It’s a brand new day. The question is can the Aztecs take advantage of this precious opportunity? Tipoff is at 6:20 pm Pacific time on TBS. NM lost to friggin’ Harvard…. HAHAHAHAHAHA. This just in: 15 seeded Florida Gulf Coast (yeah, I know, I’ve never heard of them either) just took down perennial Big East power, second seeded Georgetown 78-68. The winner of tonight’s SDSU-Okie game gets to play the Eagles of FGCU. Stephens and Rahon were awesome tonight. Yup. Rahon manned up mightily tonight. Stephens started off HORRIBLE….and I mean HOOORRRR IIIII BBBBBLLLLE. Dude was a serious liability. Notice how Fish subbed Spencer in so quickly. But the guy seriously made up for it in the second half. DeShawn Stephens finally became a MAN tonight. Totally forgiven. Well done! That second half resurrection has to be owed to Fisher. It was driven by a balanced attack on the boards and ball possession, along with the rising of Stephens and Rahon and Franklin’s selfless intensity. A really great game to watch.